The Tassel Club show THURSDAY night only! 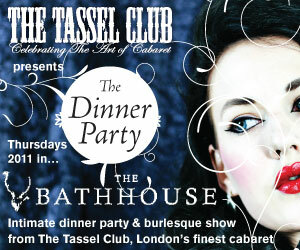 The Tassel Club hosts one exclusive show per week in the beautiful Victorian venue: The Bathhouse 8 Bishopsgate Churchyard City of London EC2M 3TJ ph 020 7920 9207 info@cirqueducabaret.com for booking We are no longer working in Proud Cabaret on Saturday nights. We hope to see you all at our new Thursday night show in our new venue. info@cirqueducabaret.com for bookings and further information.